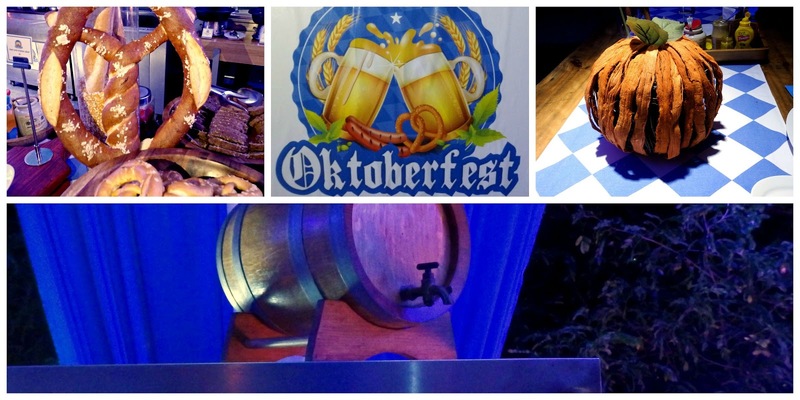 Lively German folk music, laughter and tantalising aromas greeted us as we walked through 365 AS into the Arena, venue of Hyatt Regency Chennai's Oktoberfest. setting.) But the straw-covered pumpkins, condiments on the table, and the giant pretzel that graced the bread station told us we were part of Chennai's version of the Bavarian beer and sausage festival. This is the 4th year that HRC is hosting the festival and it's getting better. 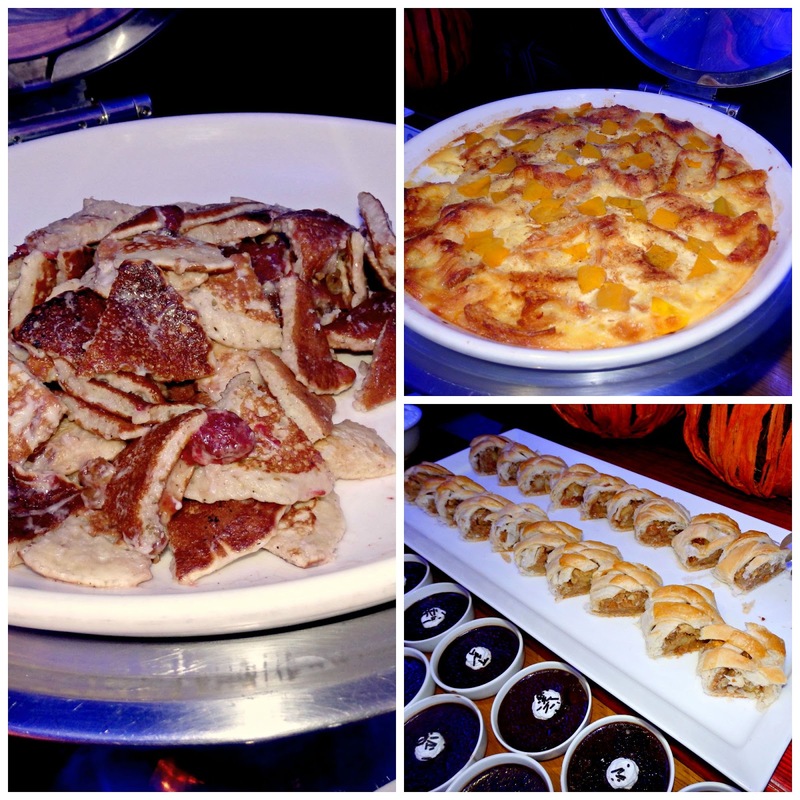 Pretzels, kaiser rolls and pumpernickel bread slices that you could just go on eating, plenty of salads, the carving station had an interesting looking roast and the desserts were on a table all by themselves. And sausages and beer - how can it be Oktoberfest without sausages and beer? My friend and I chose Erdinger, also on offer were SNJ and Schnieder. 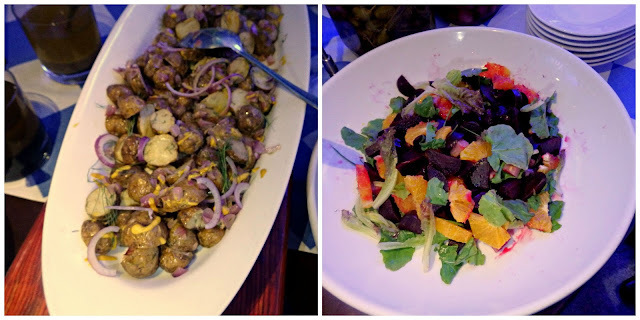 We started with German potato salad with bacon and for the vegetarians, with dill, a ham and cheese salad and a pork, baby beet and orange salad. We particularly liked the last one, the beets were sweet and the tangy segments of orange along with peppery arugula was an explosion of flavours and colour. The ham and cheese salad is simply not to be missed. Cubes of cheese and ham mixed with salad leaves - better than a sandwich any day! Hot off the grill came a plate of bratwurst, pork bockwurst, chicken frankfurter, chicken nuremburg and a snail sausage. All the sausages are imported specially for the fest and what can I say - man, those Germans sure know to make a mean sausage! Do pair them with mustard for an unbeatable combination. The tempo was picking up, more guests arrived and the atmosphere became carnival like. The music got to everyone and I could see plenty of feet tapping in rhythm. 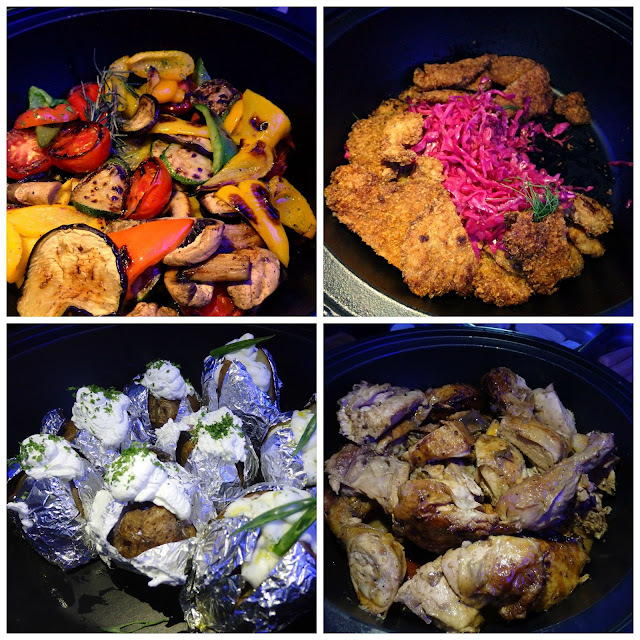 The chafing dishes held tender pork wiener schnitzel and sauerkraut, grilled vegetables, roast chicken with jus and baked jacket potatoes topped with a dollop of sour cream. There was also a divine mushroom and spinach strudel - loved the earthiness of the mushroom encased in crisp dough, Yummy! The chef carved us a slice of roast pork. It was, in one word, exquisite. The meat was tender, well cooked, perfectly seasoned and the flavour of rosemary shone through. Paired with an apple and a cranberry sauce, the slight acidity of the sauces added another flavour dimension to the pork. For dessert, there was delicious Kaiserschmarn - slices of pancake served with syrup and cream, though we had them with a cranberry syrup. The pumpkin bread pudding with a faint hint of pumpkin spice was pleasant and I liked that it was not too sweet. The apple strudel was a let down - the pastry was not crisp enough, and the filling had an overdose of cinnamon. The chocolate pods were quite a surprise. Expecting it to be stodgy pudding, it turned out to have a thin crust and an absolutely smooth coffee and chocolate sauce. Devilishly decadent! We loved the food, the ambiance, service and of course the cold, cold beer. What more can one ask for on a hot September evening at Chennai? 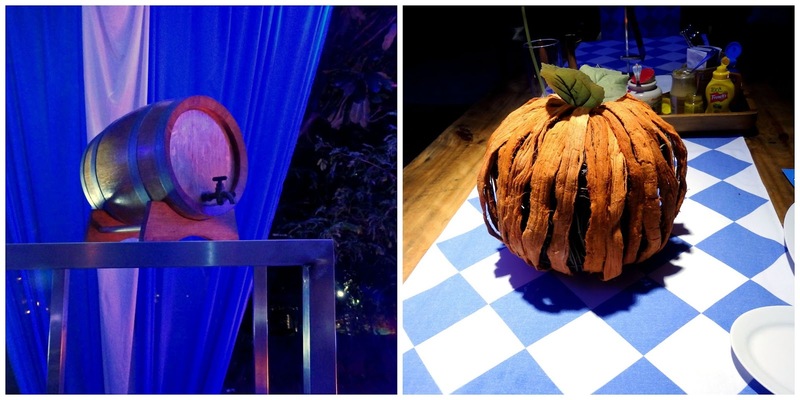 HRC's Oktoberfest Season 4 will be on till October 1st. 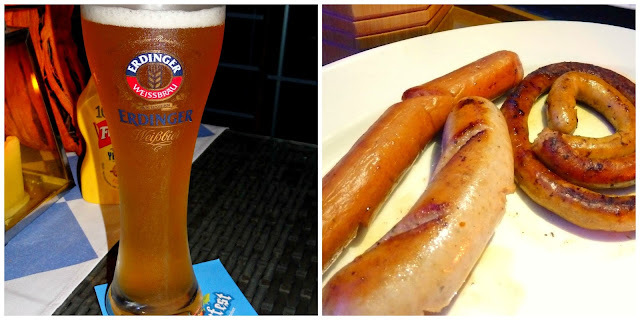 The menu does change every day, but then, it's all about the sausages and beer, right? Reservations at 044 61001234 / 9884000521.